At the beginning of World War 2, Germany invaded Poland, causing France, Great Britain and Canada to declare war on Germany. By the spring of 1940, the German army was ready to invade France, defended by not only the French military, but also a sizable British force as well. Within six weeks, the Germans defeated the Allies and seized control of France. By 1944, the Germans knew that the Allies, also now including the United States, among others, would attempt an invasion of France to liberate Europe from Germany. The Allied forces, based in Britain, decided to begin the invasion by landing a huge army at a place called Normandy Beach, which is located on the northwest coast of France. Code-named "Operation Overlord", and commanded by American General Dwight D. Eisenhower, the Allies landed on June 6, 1944 at five beaches in the Normandy area with the code names of: Utah Beach, Omaha Beach, Gold Beach, Juno Beach and Sword Beach. Prior to the actual amphibious invasion, Allied planes pounded the Nazi defenders and dropped thousands of paratroopers behind German lines the night before the seaborne landings. Local French Resistance forces, alerted to the imminent invasion, engaged in behind-the-lines sabotage and combat against the occupying Germans. 156,000 American, British and Canadian troops met heavy resistance from the German forces defending the area, but were able to punch inland, securing safe landing zones for reinforcements. The German failure to successfully defend the Normandy area from the Allied liberation forces in essence doomed Hitler's dream of a Nazi controlled "Fortress Europe" and marked the beginning of the end for Germany. --The D-Day Museum in Portsmouth, England claims a total of 2,500 Allied troops died, while German forces suffered between 4,000 and 9,000 total casualties on D-Day. By the end of the of the entire Normandy Campaign, nearly 425,000 Allied and German troops were killed, wounded, or missing. Purdue and Indiana University researchers are commemorating the 65th anniversary of D-Day by releasing the first version of a 3-D, interactive model of the Omaha Beach battlefield.--Purdue and Indiana University researchers are commemorating the 65th anniversary of D-Day by releasing the first version of a 3-D, interactive model of the Omaha Beach battlefield. American Battle Monuments Commission- the homepage for the American Battle Monuments Commission. Comprehensive information about the war cemeteries, memorials, etc. that are administered by the ABMC. A complete listing of all American war cemeteries on foreign soil with corresponding information can be found here. American Experience, The: Guts and Glory - first-hand stories and strategies behind two monumental World War II events: the D-Day invasion and the Battle of the Bulge. Desperate Battle: Normandy 1944 - based in part on the documentary, The Valour & The Horror - Canada At War. Explores Canada's involvement in World War II. Normandy Allies - non-profit organization which commemorates the liberation of Normandy in 1944. Offering a summer study trip designed to educate students about this historic and monumental feat. Normandy: 1944 - offers a virtual march through the World War II invasion by means of photos, articles and essays, interactive maps, audio and video clips, and transcripts of first-person accounts. Excellent site! D-Day account of LTC John G. Burkhalter - personal account of D-day on Omaha Beach as part of the Big Red One. D-Day memories of Jim Wilkins - Jim Wilkins was with The Queen's Own Rifles of Canada, Company B. First Wave at Omaha Beach - from the Atlantic Monthly. Map of the Beach Assault - indicating the location of the defensive positions and where the Allied Forces landed. 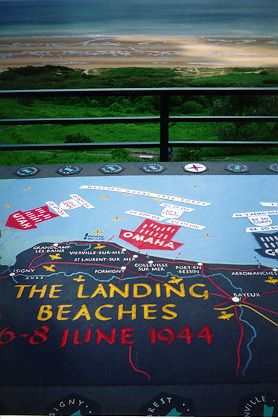 Normandy: 1944 -- Omaha Beach - from Britannica Online. Omaha Beachhead 6 June - 13 June 1944 - from the American Forces in Action Series Historical Division War Department. The 29th Infantry Division--Information on a U.S. Army division at Omaha Beach. World War II Buddy--Memoirs of Albert J. Yascavage, a disabled United States combat veteran of WWII who landed at Omaha Beach. He wants to hear from former soldiers of the Second Signal Company - Second Infantry Division, and former members of the 109th Field Artillery - 28th Infantry Division. 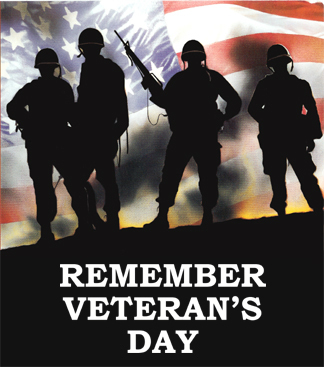 This page is designed to tell the stories of World War II vets. The History Guy®: The Raid at Dieppe (1942)-- Page containing links to the costly Allied raid on the Frech town of Dieppe in 1942. 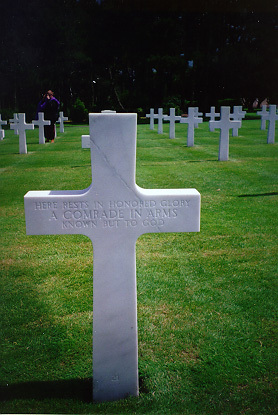 An Unknown Soldier's Grave at the American Cemetary at Normandy. A map of the invasion at Normandy, with the landing beach in the background. 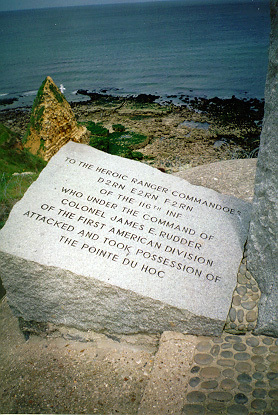 A monument to the bravery of the American Rangers who took Pointe Du Hoc fromt the Germans on D-Day.